Proudly representing the Association of Tennis Professionals, Merrick, N.Y.-native Scott Lipsky recently took a break from giving opponents service ace-induced whiplash and enlightened Long Island Tennis Magazine on the man behind the racket. Scott began his journey towards the dual worlds of professional tennis and Long Island celebrity status … at the tender age of six. While most of his post-toddler peers spent their time either unproductively glued to a television set or wreaking household havoc, Lipsky had discovered a more vocational approach to his childhood fun. Currently strictly a doubles player on the ATP tour, Scott received his first formal instruction at the Mid-Island Indoor Tennis Courts in Westbury, N.Y. When asked to bring up his first tennis memory that didn’t involve leaving tennis ball imprints on the facade of his house, Lipsky is quick to cite one of his earlier competitions. He was forced to learn the hard way that only his racket (or the ground) is supposed to touch a ball in play. Scott had no intentions of letting that particular rule comprehension distract him from what he eventually wanted to accomplish. When discussing the pros he admired growing up, Lipsky names “Pistol Pete” Sampras as his all-time favorite. However, Lipsky feels his own style of play differs a bit from the serve-and-volley style that Sampras employed during his years of dominance. While attending John F. Kennedy High School in Bellmore, N.Y., Lipsky played for the school and tested his skills on the competitive United States Tennis Association Junior Circuit. By this time, he would hone his court marksmanship at various tennis locales throughout the Island, 90 minutes a day, six times a week. Although many top-ranked youth players elect to forego the high school tennis scene and just play the Junior Circuit, Lipsky believed that his skills flourished within the group dynamic. Still, many other blue-chip junior players flock to tennis academies in warmer climates to dedicate themselves to their craft year-round, however, the routinely uncooperative New York weather would prove not to be much of a hindrance for Scott’s development. His philosophy kept him moving in the right direction, as he captured a USTA National Doubles 16-and-Under Championship Title with partner Jeremy Wurtzman, a feat which he reveres as his most glorious experience from the junior level. Scott began to believe that his own impressive tournament displays among the game’s up-and-coming elite, were an indication that he could use tennis as a launching pad to go as far as he wanted. As his days of razing a path through the high school ranks began nearing their conclusion, Lipsky’s play found him high on the radar screens of a few prominent collegiate tennis programs and left him in a fortunate enough position to enjoy the ride. The final verdict came down to whether Lipsky would be brandishing his racket clad in Duke Devil blue or Stanford Cardinal red. In the end, he opted for the latter, and headed for what would be an exciting change of scenery on the West Coast. With the usual zeal that has defined him as an individual, Lipsky refused to shy away from the new responsibilities that assimilation into the high-profile Stanford realm of athletics and academia would bring. Nor did he did seem fazed that his rigorous tennis schedule would cause him to miss out on the occasional collegiate social gathering. When asked if he would rather play doubles or singles matches, he revealed that he was happy regardless of who occupied the court with him or was on the other side of the net. As a Stanford freshman, Scott’s presence paid immediate dividends, applying the finishing touches to a powerhouse team that would win the 2000 NCAA National Championship. He would eventually earn All-American honors three different times and rose into one of the nation’s premier doubles tandems, along with partner David Martin. Soon after graduating from Stanford in 2003 with a degree in American Studies, Lipsky’s dream of making it to the level of professional tennis had become an inspiring reality. Despite being content to be where he was, he found that his early days on the tour were a bit less flashy and more daunting than originally expected. Sponsored by K-Swiss and Wilson, Lipsky travels about 30 weeks a year playing in worldwide ATP tournaments, including a few Grand Slam appearances. He has graced the Arthur Ashe Stadium courts in front of his fellow New Yorkers at the U.S. Open, which he thoroughly enjoyed; but he says that nothing can compare to the mystique and electricity in the air at Wimbledon. 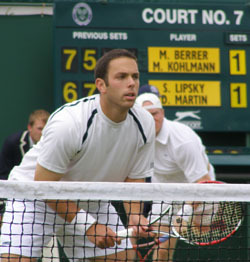 The highlight of Lipsky’s professional career thus far came when he and David Martin defeated the renowned, duo of Mike and Bob Bryan in February of 2008. The record-setting Bryan brothers were then ranked number one in the world in doubles. “That was kind of a surreal experience, that whole week,” Scott felt humbled after the victory; one that saw his still fledgling tennis career come full circle. That day, Lipsky and Martin earned their first ATP title and career high placement within the world’s top 40 in doubles play. In order to achieve those goals, Scott believes he’ll have to make a few small mental adjustments along the way. He maintains that the American presence in professional tennis is fairly pervasive despite juggernauts Rafael Nadal and Roger Federer monopolizing most of the press clippings. Lipsky says he and his countrymen always pull for each other to win, or may give each other strategic tips when facing certain opponents because the overall success of American-born players reflects well on the entire United States program. There is also a strong sense of patriotism that goes into representing one’s homeland on an international athletic stage. The small amount of time that Scott spends off the court is spent at his home relaxing in the nonchalant environment of Huntington Beach, Cali. Compared to Long Island, he feels the weather is nicer, allowing him the picturesque benefit of practicing outdoors and the people are generally more laidback, but he points out that the Pacific Coast traffic certainly isn’t any easier to navigate through.